My name is Bryon Keim, 50 year old LW Masters Strongman and I have been with Mike for a year and a half. 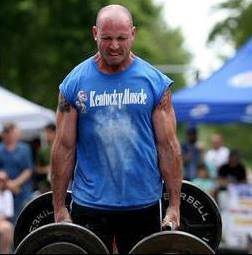 I'm in my 9th year of strongman and so far my only regret is that I didn't have Mike as my coach this entire time. I have made more strength gains in my time with Mike than I did the previous 8 years. ​I first met Mike in 2015 following USS Strongman Nationals, I went into that comp with high expectations and left with my confidence totally destroyed. Over the next 7 months Mike built me back up mentally as my strength surpassed all of my previous bests. My first strongman comp with Mike as my coach was Central Georgia Strongest Man, March '16. I entered the open masters division open meaning there is no weight class. There were 9 of us, all over 250 lbs except me. I weigh 200 lbs, and I took 4 th place. First thru third place, each competitor weighed over 300. I'm not bragging, the point is Mike had me ready to compete and because of his coaching I was able to beat 5 other masters while weighing 50-100 less than them. And set PR's on each event. My next comp with Mike was USS Nationals '16 where I place 15th of 23. Again a body weight of 200 and giving up a lot of weight to the others in my class. More PR's on each event. My most recent comp with Mike was Florida Strongest Man. There was no masters class so at the age of 50 I competed in the 200 Men's open where I was 6 of 9. Again, all PRs and left feeling pretty good that I held my own against a bunch of 20 and 30 year olds. The only reason I mention my age or body weight compared to others is to give you an idea of what Mike is working with in me. All of these accomplishments are due to Mikes coaching, there is just no way I could do any of this on my own. In summary, I know that going into each comp I will be at my strongest, my fastest, fully recovered and ready to compete. I look forward to working with Mike for many years to come. After tearing my biceps tendon in my shoulder I thought I was done for good then, Mike was recommended to me. Since I have been training under Mike over the past year, I have strengthened my shoulders and improved my mobility thus alleviating bicep tendon pain. Not only did he help me become pain free but, every time I have competed since having Mike in my corner I have consistently hit PR’s. I highly recommend Mike’s training to any caliber athlete whether you compete or not. ​I came to Mike about 15 weeks out from the 2016 United States Strongman nationals. I had a shoulder injury that had kept me from any overhead pressing for several months. Mike proved to me that the right amount of less was more. He was able to give me the right amount of volume that my pressing was getting stronger and my shoulder was healing at the same time. Everything got stronger with his programming and I continually hit PRs in training. I was able to even win the stone series at nationals. I placed 3rd in the LW Masters class at nationals under Mike but without Mike my shoulder may have kept me from competing. Mike goes above and beyond as a coach and I always felt like I was getting more than I paid for. Thanks again Mike for the excellent programming. I started working with Mike after training almost every single day for the past 25 years. Mike immediately helped me challenge some of my assumptions about training frequency, intensity, and volume, resulting in a series of programs that have me stronger, more focused, and more injury-free at age 45 than ever before. He is incredibly responsive and for the interested student is always willing to share the thinking behind the design of his programs. I've hit PRs in every single Strongman event and contest during our time together and know that he'll keep me strong and improving for the next decade, at least! I competed in the United States Strongman Nationals, where I placed 13th in the Masters division. Two weeks later I set at PR in Axle C&P at the MN State Championships (with WSM veteran Wade Gillingham there as a judge!). More recently I set multiple PRs -- including Atlas Stones -- at the MN Winter Strongman Assault...where I placed 3rd in the Masters Division. Unfortunately had to drop out of the 2017 Arnold due to surgery. 2. Mike works with you on injuries and will work around them with alternate exercises. Mike has been really excellent in managing my fatigue during training; something that is really refreshing to see in online training. With typical online trainers, you pay for a 12-week program, and you're on your way. With Mike, you pay not only for his expertise but his attention, and he always delivers. He pays attention to how you're doing, and will change the program on the fly if needed. I've hit numerous PRs with Mike. My first 300 pound log (for reps! ), first 1,000 pound yoke, among others. I love working with him and plan on sticking around for a while! ​I was introduced to Mike about a year ago. He elevated me immediately to a level I never thought possible. His guidance, expertise and care was truly appreciated. He accommodated every possible situation and rewrote programming to always achieve the best results. I would not be competing the way I am, if it weren't for Mike.